The radioactive nuclei RED will decay into daughter product, and the daughter nucleus will decay grand-daughter stable nucleus. It will decay into blue-> grey (and become stable nuclei). click start and watch how the number of different nuclei changed with time -- colored traces. The law of radioactive decay predicts how the number of the not decayed nuclei of a given radioactive substance decreases in the course of time. 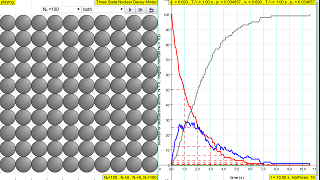 The RED circles of this simulation symbolize 100 (variable selectable up 400 or 1024) to atomic nuclei of a radioactive substance whose half-life period (T1 1/2) amounts to 0.1 to 3.0 seconds. However, in real life, sometimes these intermediate state N2 in BLUE are unstable themselves and are also radioactive whose half-life period (T2 1/2) amounts to 0.1 to 3.0 seconds, into the stable state N3 GREY. λ, or sometimes also known as "lambda" the inverse of the mean lifetime, sometimes referred to as simply decay rate.